We have hand picked each item in the Microfiber Starter Kit because they are highly effective when paired together. To create the best kit possible we utilize our years of detailing experience, combined with input from some of the best detailers around the country. We are confident you will get outstanding results with each item and really enjoy how your vehicle looks afterward. Save $42.31 off of the retail price of individually purchasing these items! DI Accessories Reclosable Storage Bag (24" x 24") - simple solution for storing microfiber towels! This is definitely a significant investment in towels and I was leery about making it at first. However, after completing a full detail over several days, I can certainly vouch for the need for this many towels. The quality is awesome and you get pretty much everything you need. I still have a few towels from AutoZone handy for doing nasty jobs like door jambs, engine bay, and wheels cleanup. I would almost feel bad using the DI towels for these jobs. Definitely recommend this package, in spite of the cost. 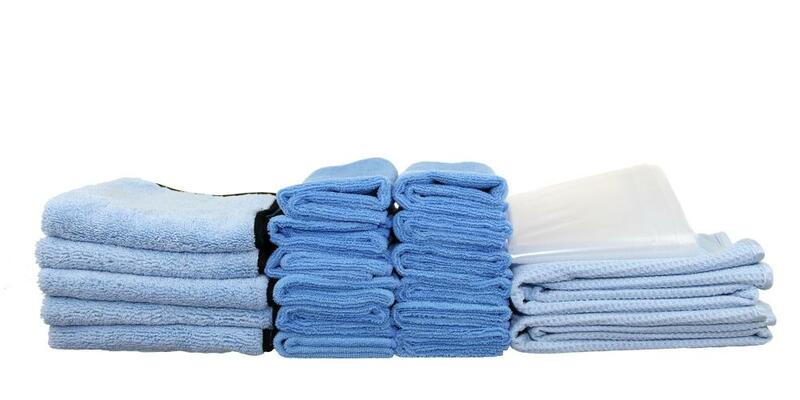 Great assortment of quality towels. These weren't my first, but really beefed up my towel inventory. Waffle towels are great for drying. All purpose for polishing/removal, and ultra plush for waxing/sealants. Good value !